They’re the best at what they do and what they do ain’t their best. Well, it’s finally happening. After nearly 25 years Police Academy: Mission to Moscow hit theaters in 1994, another installment in the film franchise is in the works. Actor Steve Guttenberg, who portrayed Carey Mahoney from the 1984 original to the fourth film “Citizen on Patrol”, said in a Twitter post that the eight film is underway. There have been rumors of another installment since the early 2000s when series creator Paul Maslansky was ironing out the script but until now, nothing has come to fruition. The project would be placed on the back burner for another decade. Guttenberg was asked on Twitter by fans regarding the film to which he replied, “The next Police Academy movie is coming. No details yet, but it is in a gift bag being readied!” No doubt AT&T is trying to revive older franchises after their purchase of Warner Bros. If a new Police Academy film is in the works, Steve Guttenberg would likely not be the only cast member who could appear. Sadly, a few cast members are no longer with us including George Gaynes who played Commandant Eric Lassard. Gaynes is best known for his amazing comedic timing which provided some of the films’ best gags. Others include Bubba Smith, who portrayed the powerful yet lovable Hightower and David Graf who played the trigger happy Eugene Tackleberry. But, there are still a few among us including Michael Winslow, known for his role as Larvell Jones, the human beatbox; Marion Ramsey, the squeaky voiced Laverne Hooks and Bobcat Goldthwait as former gang leader Zed who could have recurring roles should the film come to life. Of course there will need to be new faces to help the reinvent the franchise for the twenty-first century and bring it to a modern setting. 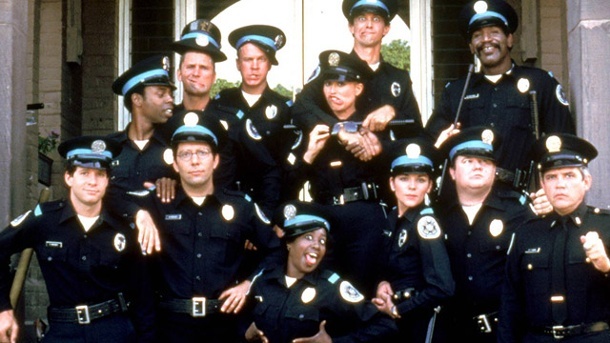 Police Academy opened on March 23, 1984 and was a commercial success, taking in $8.1 million in its first weekend despite strong competition from other films Gremlins, Splash, The Gods Must be Crazy and Ghostbusters. It went on to take in $155 million on a $4.5 million budget. While the first film receive favorable reviews, the following six sequels were met with negativity from critics. The franchise also spawned an animated and live action spin-off television series.